Business models can be useful for a variety of reasons. Whenever you come upon a problem on the job that seems to have you stumped, it is likely that a model exists to help you work through the issue. In this case, we are going to be talking about models that help you make smart decisions. 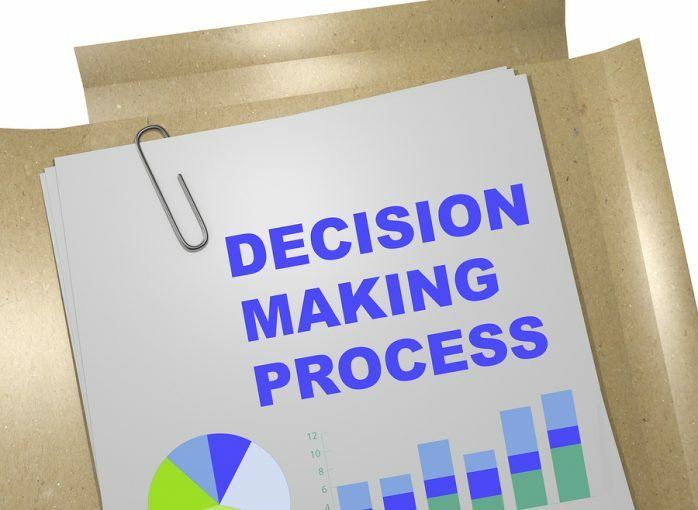 Of course, decision making is a critical part of any business, so these models should be considered a valuable piece of your operational toolbox. Below, we have listed five decision-making models which have served countless businesses over the years. Take a few moments to get familiar with each model, and consider putting one or more of them into use the next time you need to make a key decision. At the heart of the Vroom-Yetton-Jago Decision Model is the fact that not all decisions are created equal. Some decisions are extremely important and will require input from many people, while other decisions can be made quickly as they won’t have long-lasting effects on the company as a whole. Understanding this basic concept is important, because you aren’t going to use the same decision-making process for all choices that you have to make. With the assistance of this model, you can customize your approach to decision making based on the situation at hand. Decision Quality. Simply put, this is where you think about how important it is to come up with the right decision. Sure, you always want to make the right choice, but some circumstances are more important than others in the context of business as a whole. Committing a large number of resources to each and every decision you make would be inefficient, as many decisions just are not important enough to warrant that kind of investment. Pick and choose your spots and only invest a large amount of time and energy into the decisions that are truly going to shape your organizational future. Subordinate commitment. Some decisions that you make are going to have a strong impact on your team, while others will not affect them at all. When thinking about each decision, consider how much of an affect it is going to have on your team and others within and around the organization. If you it essential that you have ‘buy in’ from the people on your team, you will be more inclined to include them in the decision-making process. If not, you may be able to make the decision on your own with very little input from others below you. Time constraints. Obviously, the timeline that you have in front of you for a given decision is going to impact the process that you can use to make your choice. If you are in no particular rush to make the decision, there will be plenty of time to include others, conduct research, and more. On the other hand, if the matter if time sensitive, you might not really have the option of going to others for help. Develop a clear timeline right up front for your decision and then chart out whether or not you are going to have time to get input from various areas. Once you have held up the decision you need to make to the light that is offered by each of these three points, you should have a much clearer picture of the path needed to make a quality choice. Moving on, you will then decide which leadership style will be best for making this decision. You can pick from three options – autocratic, consultative, and collaborative. You can read more on the specifics of this model for more detail on these three, but their titles largely speak for themselves. By thinking about the factors that make up each decision, and the type of leadership style best-suited for the decision, this model can lead you to a wise choice in the end. As an owner or manager, it is up to you to make the tough choices that steer the business in the right direction. To do so, you may wish to turn to tools such as the OODA Loop. This model is relatively simple and straightforward, but it can be highly effective. When you think about the operations of your organization in the frame of the OODA Loop, you will quickly see that you are never going to be finished making decisions. This model is a loop for a reason – it continues with no end in sight, for the life of the organization in question. That’s it. It is a simple model, yet it says so much about how you are going to make decisions in business. Three of the four stages – observe, decide, and act – are pretty straightforward, and will be familiar to any business professional. That second stage, however, – orient – might be foreign. The idea here is that you need to orient yourself correctly with the information at hand in order to make a good choice. Allowing your personal orientation to get in the way, such as past experiences which really aren’t relevant to this decision, you might not come away with the best decision. In business, you don’t always have a lot of time to make a quality decision. While it would be great to be able to sit down in your office for a period of time to think through the various options at hand before making a choice, that simply isn’t how things work in the real world. Sometimes, you have to act quickly based upon the information that you have available. When that is the case, you might want to turn to the Recognition-Primed Decision (RPD) Model for assistance. At the first stage, you are going to ‘take in’, or experience, as much as possible about the situation that needs to be solved. If you don’t have all of the information available at the time, you aren’t going to be able to make a clear and appropriate decision. One of the best things you can do at this stage is to listen. Listen to the people who are directly involved in the situation and will be able to tell you exactly what is going on, why it is a problem, and how they think it may be fixed. Once you have a basic understanding of what is going on and why it is a problem, you next need to move into the analytical process to start to work toward a solution. You can ask yourself a number of different questions at this stage in order to trigger potential solutions based on past experience. For example, what about this situation is surprising, and what parts of it might you have seen coming? Is this something that has happened previously, even if in a slightly different way? Finally, once a decision has been made, it will need to be implemented in a timely manner in order for it to be able to actually take effect. It does no good to quickly make a decision if you are then going to take your time implementing your choice – so get right down to business on putting this decision to work once you have gone through the first two steps of the model. As you are thinking about the various decisions you can make, the implementation phase is something that should always be in the back of your mind. After all, it isn’t going to be an effective decision if you aren’t able to implement it quickly to rectify the situation. Only those choices that are going to work in the practical application of implementation will be successful in the end. Understanding priority is an important part of making good decisions. Even if you don’t think about it consciously at the time, it makes sense – you are making your choices in most cases based on the underlying priorities that you have in mind. Of course, the priority in business is often to make money, but that isn’t always the case. Or, at least, that isn’t always the guiding light for the decisions you need to make. So how do you make a decision when you aren’t exactly sure where your priorities lie? The Paired Comparison Analysis model is a great way to make tough choices that have many complexities to consider. The process of using this model involves first creating a table which is going to layout all of your various options. Every option you have at hand with regard to the decision that needs to be made should be listed in the chart, both across the top and down the side. Now, you have a chart that will let you compare options directly against one another. This is where the ‘paired analysis’ comes into the picture. You are going to compare one option against another, and determine a winner. Repeat this process until all options have been compared against all other options. In the end, the option which has won the most head-to-head showdowns should be considered the winner. This isn’t going to be the right decision-making tool for every situation, but it can help to shed some light on a situation where there are many competing options at play. The idea behind the Ladder of Inference is to help you avoid making poor judgments based on your past experiences, biases, or other factors. You should be aiming to set aside as much personal influence as possible in order to make choices that are simply in the best interest of the organization as a whole. In this model, there are a total of seven ‘rungs’ on the ladder that is supposed to represent the common thought process that we go through while making decisions. Those rungs are as follows – listed from bottom to top as they would be seen on the ladder. If you think about how this theory of how we think would work in the real world, you can see how it might be dangerous when making business decisions. Specifically, your judgements can be warped as they move through the ‘selected reality’ and ‘assumptions’ stages. When you allow your own personal beliefs to interfere with the choices you are making, you might lose track of the actual facts that are sitting right in front of you. In many ways, using the Ladder of Inference is all about tearing apart your lines of thinking in order to build them back up again on a better foundation. It is only human nature to start to make decisions quickly when faced with a new problem – even if those decisions really aren’t based that deeply on facts. So, by using this model, you can effectively look for holes in your logic, only to plug those holes and then move back up the ladder again in a logical manner. You always want to be able to defend your decisions in business, and using this tool will help you to do just that in the end. If you have not previously used any of the decision-making models included in this list, you are likely going to appreciate what they can do for your business once you put them into action. You may find that you start to use these models regularly to make even minor decisions, or you might only put them to use when big choices come up. Whatever the case, your performance on the job should benefit from the assistance of these models. This free eBook describes the top 5 popular decision making models. These models can help you to use facts, analysis, and a step-by-step process to come to a rational decision.